Product prices and availability are accurate as of 2019-04-23 15:53:17 EDT and are subject to change. Any price and availability information displayed on http://www.amazon.com/ at the time of purchase will apply to the purchase of this product. 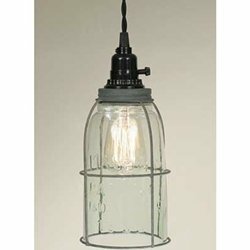 Vintage Barn Roof Half Gallon Caged Mason Jar Open Bottom Industrial Pendant Light Lamp Caged Mason Jar Open Bottom Pendant Light is made with recycled glass and is a reproduction of an antique Mason Jar from the 1880s. 4½" diameter and 11¼" tall. Includes a half gallon mason jar with no bottom. Use these for higher wattage bulbs such as 40 or 60 watts. Shown with our 40 watt vintage Edison bulb, available separately With the open bottom and ventilation on the top, these provide plenty of light while keeping everything cool. Our pendant lights include it all: 15½ foot cloth-covered lamp cord with switched socket, two finished ceiling hooks, two cord clamps for adjusting the height of the lamp, and easy-to-follow instructions. Add our option of pulleys for a really nice industrial look. These lamps plug into any wall outlet; no wiring required. They are perfect in any Country, Rustic, Primitive, Industrial, or Shabby Chic decor. These are wired for plug in installation. However, they are easily "hard wired" if you wish. Our supplier paid extra to have the cord certified for permanent installation. Please search item 920094 for hard ward canopy kit.